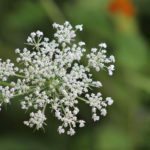 First check with your state and county about the legality of planting Queen Anne's Lace, Daucus carrota. It is highly invasive and banned in some areas. It readily sprouts from seeds allowed to fall from the plant. Lightly press into soil to keep seed from washing out during rains. Please be considerate of your neighbors and not allow it to go to seed.